I read it several times and could find no new information about my account. No changes were noted. I figured it was sent by mistake. 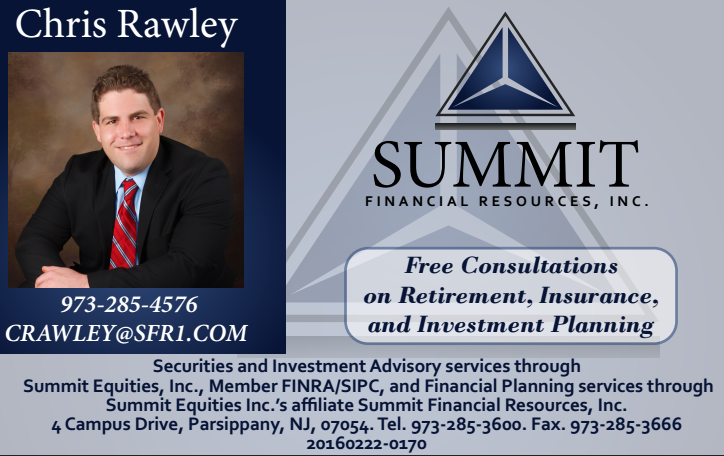 Then my wife Lynda checked what we pay every month and we got it–our subscription price was raised by what appears to be 33 percent, from …$36 to $48. Raised–without telling us it was an increase. Raised–without even using the word change in its letter. Look, I understand price increases. I worked for The Star-Ledger for nearly 50 years and made a good living. Employees should be paid well. Good journalists don’t come cheap, and shouldn’t. What really hurts is the way this price increase was announced. Maybe the newspaper ran something in print earllier, but I couldn’t find it. Maybe it will run something in the future. In the past, we would make the argument that the costs of printing a daily newspaper are always rising. We would say we had a good product and were striving to make it better. And we would make the argument before the price increase went into effect. We were honest and upfront. Sending a letter that does not at all mention a price increase is not honest. I will not cancel and I urge fellow readers not to cancel. Now more than ever, New Jersey needs a good statewide newspaper and The Star-Ledger is the only candidate that can fill that role. It has excellent journalists, photographers and reporters, many of whom are my friends. I hope that, with the added resources provided by the price increase, they will be given what they need to fill that essential role. The newspaper’s management needs to make that case to its readers. The bond between a newspaper and its readers is unlike that of most commercial transactions. Readers need to trust that it will be open and honest–not just on its news pages but also in its sales departments. I suspect–without knowing–that circulation has been outsourced or, at least, centralized outside New Jersey. My fervent hope is the management of The Star-Ledger will encourage its circulation department to respect the intelligence and good will of its readers–and trust them to accept a price increase they can be assured will be used to improve the newspaper. Was SL Circulation outsourced to a right-to-work state? I saw this when I got my credit card bill and I am not sure I can keep the subscription. This is a huge increase. A couple dollars okay. Twelve dollars at once? No. I have kept my subscription going in part to keep the paper going but I won’t be played for a fool. I didn’t even get a letter! I have spoken to a number of readers who say they would be willing to pay the increase–if only The Star-Ledger had not been so deceptive about it. Shame on the newspaper’s management–and, while I have kept my subscription, I can perfectly understand why so many have cancelled. This papers methodso are contemptuous to the subscriber. We have been subscribers here for fotry years, last year they told us we were going to receive an magazine that we did not request as poo art of our subscription and that the payment for it would be deducted from our monthly “term”. We were being forced to accept an item we had no interest in possessing. My mother recently passed away and I stopped all credit card automatic payments, the Star-Ledger continued sending papers, so I assumed that the bill had been paid in advance. Once the papers stopped coming I applied to pay by check and sent the money in, but that other period was being billed. Now I find that my 3 month payment is stopped short at 6 weeks. I will be calling my division of consumer affairs. I got this B.S. 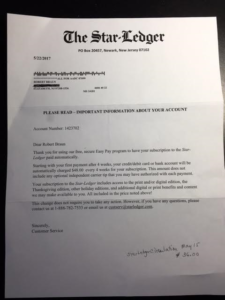 letter on 6/28/17 from the Star Ledger which AUTOMATICALLY increases my Thursday and Sunday delivery from $17.00 to $24.00 per month. I tried calling their useless customer service number and was put on hold for 10 minutes before finally giving up. Their CS phone lines NEVER pick up. I think that’s just another one of their scams. So, I emailed them and told them to cancel my subscription immediately. They replied that this can only be done over the phone (which NEVER picks up). I am DONE with the Star Ledger, there is no way their newspaper is worth this price increase. Maybe this is how they want to “thin the herd” of their subscribers by screwing all their loyal customers. Hi, I just received my quarterly invoice and the price of the paper went from $95.40 to $135.00. I certainly understand increases but this is a little outrageous. In the past few years, changes to format and news coverage has been lacking. A little I can take, this kind of an increase is a “little” too much, If there was a notice of the increase I missed it and had to call today to verify the price was right. I’ve been a subscriber for over 30 years and it appears it’s time to say goodbye, I can get my news online. I never got a letter. I pay by credit card every 3 months. In March 2017 it jumped from $95.40 to $120. I decided to pay it because it is the only paper that covers the state & for certain columns (Bamboozled) that I enjoy. I paid the same amount in June- $120 + tip. Yesterday I received our bill for the next three months. $144! I am done! There are offers on line for 10 wks for $79.50 & even less! Why should a loyal customer of over 30 years be treated this way? I am done! Sigh… My experiences with the Ledger match those of Mr. Braun (I remember his columns back-in-the-day BTW) and the other consumers. Did you know the Washington Post has a digital only subscription for $39 A YEAR!! Fast foward to 1 year later. I get a letter from Star Ledger stating my Thurs & Sun plus digital subscription is going up to $42./month. I was also getting tired of their gimmicks where they send you an email stating ther will be a special section in an upcoming edition which you will be automatically billed for or you can call them to not receive that section and not get billed for it. Worse yet is the one where they state your bill is not going up for the special section but they will shorten your subscription to cover the cost. So I call and cancel. They first offer to lower the price to the previous cost and then offer to lower it even further. I decline and cancel and actually receive a check in the mail for the remainder of my subscription. A week later calls start showing up on my caller ID from Star Ledger MAI without any message. After a week of these I finally answer. Their offer – 1 year of Thurs & Sun plus digital for a one time upfront charge of $39.90. They claimed no ridiculous auto renewal. I will call in at the end of the year to renew the deal or cancel. That’s 8% of what I was paying. I save $464. per year if this works out. So far the charge has hit the credit card, no paper yet but it’s only been a day. I noticed they’ve been charging my mom just about $150 every 10 weeks (7 day hard copy) and when I called to ask about this (given that it’s twice the advertised $31.80/month subscription rate) the response was “prices go up you know.” Apparently my folks have been paying WAY more than subscription rate for a very long time, without realizing it. Speaking with the SL folks about this left me with a terrible taste, as though I was speaking to scammers. I am not saying they are but they were behaving that way. When they refused to provide a rate more in keeping with what others are paying I asked what happens if I cancel and then begin a new subscription for my 87 year old mom at the advertised rate? The answer was “can’t tell you if that would work” .When I asked how long the $31.80/month advertised subscription rate was good for, the answer was “can’t say”. A week? A month? A year? “Can’t say.” Round and round we went for a long time and they danced, avoiding answering any question in a forthright manner. I ultimately canceled the paper….$150 every 10 weeks is not the way to treat decades-long subscribers when anyone can sign up today for half that. Very disappointing. I knew some wonderful SL reporters in the past who were committed to fact checking and truth and although I knew some of the other reporting was terribly inaccurate (I would be in the same room witnessing what people said at meetings, for example, and then read what the paper said they said and there was not remotely a match) I hoped the paper would continually work toward excellence across the board, and provide great customer service. Sad.